I wasn’t even a passable community theater actor. So of course I just had to audition for Stanley Kubrick. Early spring of 1984, I saw a notice in The Twin Cities Reader that Stanley Kubrick, the cinematic mastermind behind 2001: A Space Odyssey (which the Family Project first viewed together on its release in 1968, in a drive-in theater of all places), was looking to cast young Midwestern men as Marines in his adaptation of Gustav Hasford’s 1979 novel The Short-Timers. The new film would be titled Full Metal Jacket. The first mention of it in my 1984 journal is on Wednesday, April 25: “…ran up to the community center and talked to Carlos P. about seeing if the video class could produce an audition tape for me for Kubrick’s Full Metal Jacket.” It was the same night I watched the one-act skit rehearsals and ran into Monique at the St. Boni liquor store. Three days later I was at the public library doing research on Vietnam. “I don’t know if it’s really a good idea,” I wrote in the journal, “to know so much about the film’s concept. Kubrick may be looking for naiveté and ignorance about ’Nam. He may be looking for the fresh, unspoiled type of American youth, unaware of what that youth will face in Huế or Khe Sanh. Meanwhile I was ready to return to college after three years of working at the print shop. I wrote in the journal about the University of Iowa just after Easter 1984. I knew I had to apply, forward my community college transcripts, and secure financial aid. I planned to visit the campus in mid-May. Gerry, my boss at the print shop, was sending me to Vo-Tech classes in Brooklyn Park. But I was bored and raring to get back to school. I liked learning. And I was dying to leave town. Anxiety mounted as I got ready to drive to Iowa City on the early morning of Thursday, May 10. I’d planned to stay three days, get to know the place, and enjoy a mini-vacation from work. I fell in love with Iowa City that weekend. But rather than stay another night in Iowa City, I packed up the car and made the dash north again to Minnesota. 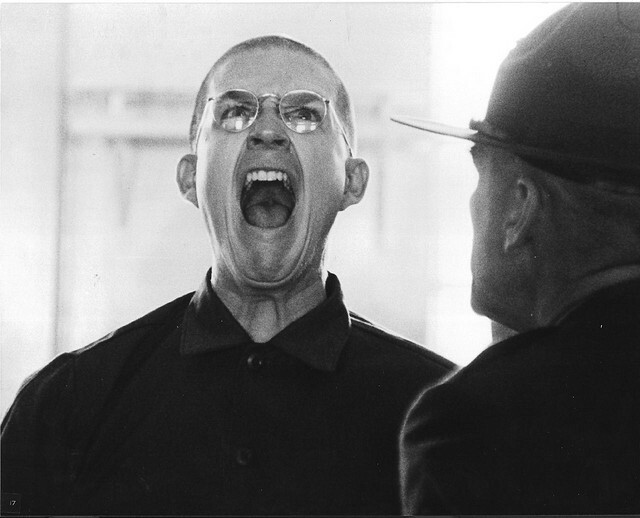 Sometime before June 17, the community center video class shot my audition tape for Full Metal Jacket. Tom LaCrosse watched from the audience seats while I emoted—dressed in fatigues and hair cut shorter than it’d been since I was a boy. I did two monologues for the cameras, pulled from the Vietnam histories I got from the library. At 5 p.m. that Saturday, I “met Terry Kargel up at the Community Center to mix my audition tape.” The journal reports we were at it for 3-1/2 hours. 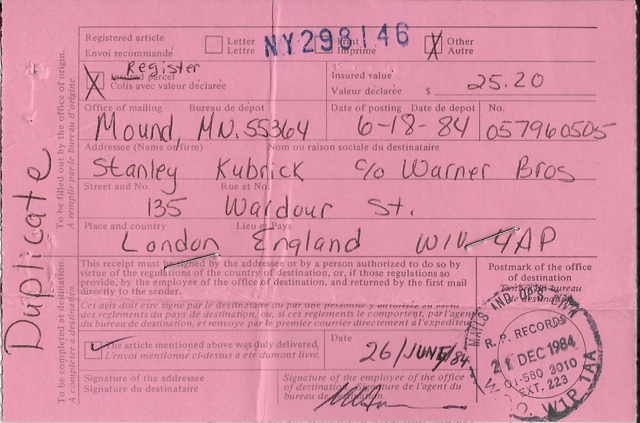 The edited VHS tape was posted to Kubrick on Monday, June 18, 1984, in care of Warner Brothers in London. ~ by completelyinthedark on May 29, 2015.